It was a mother’s worst nightmare. Frau Mendelsson’s husband was already imprisoned in the concentration camp at Buchenwald, leaving her in sole charge of their two sons, aged 12 and 8. The situation for Jews in Hitler’s Europe was worsening by the hour. Then, in February 1939, she was offered two places on a train to England – for the children, but not herself. If she accepted, she might never see them again; if she refused they might all be killed. She had 48 hours to choose, and there would be no second chance. Accepting was the hardest decision of her life. Only when he himself became a parent did Steven fully appreciate the great love and huge sacrifice involved in letting them go. At the local C of E school the children were only too eager to help them learn English, while the young Germans were equally keen to demonstrate to the teachers their new linguistic proficiency. All too soon the refugees discovered that the vocabulary they had learned was not exactly that used in polite company – though the teachers were very understanding! 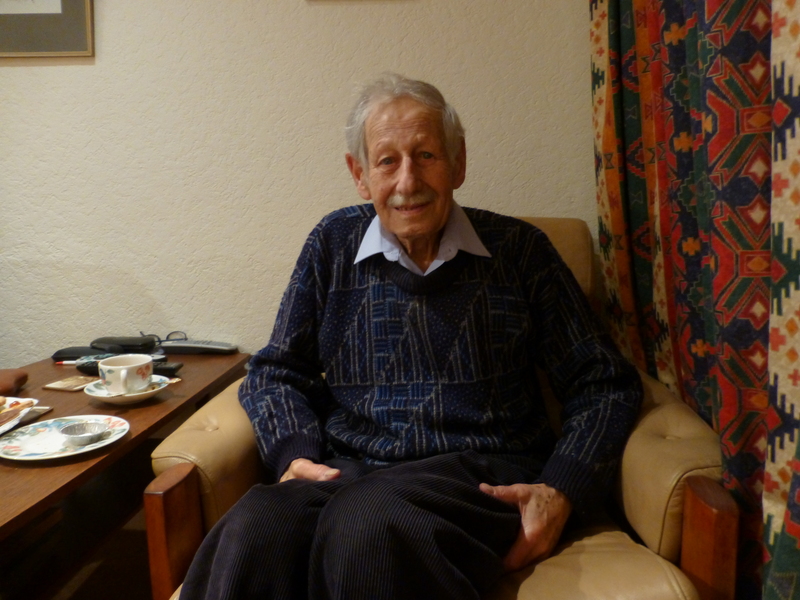 Steven told how his father, in an extraordinary twist of fate, was released from Buchenwald. ‘Hermann Goering, a Luftwaffe ace in WW1, had crash-landed in France where a Jewish pilot saved his life. Goering never forgot this, and following Kristallnacht, when all Jewish businesses and synagogues were ransacked and destroyed, he decreed all Jewish prisoners in concentration camps who had fought in WW1 should be released. His mother soon set to work to do her bit for the war effort, becoming an ARP warden. As a German speaker, when a Nazi parachutist became caught in the gable end of a house as he fell to earth, she was asked to go along and translate. ‘Tell him we’ll soon make him a nice cup of tea,’ she was instructed. She was shocked. ‘Oh no we won’t,’ she retorted. But ‘It’s an order!’ barked her superior – so she had to obey. ‘In a fortnight my mates will be here and you’ll all be dead!’ was all she got from the Nazi for her trouble. Though he himself was too old to take it, Steven helped Wally prepare for the 11+ exam to Lichfield Grammar School. A letter arrived ‘For the parents of…’ so as Wally’s were not available Steven went, instead, to see the Head. ‘Ah,’ said the 14-year-old Steven confidently, ‘but he is a refugee from Nazi oppression.’ Wally got his place. At 14, Steven started work as an apprentice toolmaker. Wanting to go to university, he studied at evening classes to pass Matriculation and remembers with gratitude the kindness of his boss who allowed him time off for this. Successful, he became an external student at the University of London, studying engineering at the Northampton College of Advanced Technology (now the City University) in Islington. Following graduation he worked in various design offices, changing his job every two years to increase his salary and prospects and working his way up from shop floor to manager in companies including Smith’s Motor Accessories, Frigidaire and Plessey. At Plessey he was an industrial engineering executive, indirectly responsible for over a thousand production engineers in 22 different plants. He combined mechanical engineering with human resource management, believing good relationships between management and workforce to be fundamental to industrial success. Being recruited by a firm of US management consultants, he worked in Canada, the US and Sweden; then, as he knew the language and background, he was asked to go to Germany. With his South African Jewish wife, Hilary, and 7-week-old daughter he moved to Germany, but as one year stretched into three-and-a-half, and one of their sons was born there. His work was in a steel plant, and before long two British steel plants sent an 8-strong delegation to Germany to study its success – and who should be the German consultant but Steven! Unsurprisingly he was promptly headhunted for his skill in negotiating contracts, so he and the family moved to Sheffield, the steel city, where he still lives today. ‘Saved by the Brits again,’ he notes. In 1980 Steven was seriously injured in a road traffic collision which saw him in hospital for 32 weeks, a wheelchair for nine months and on crutches for two years, thus ending his globe-trotting days. But, ‘Come and talk to our management school students,’ suggested a Sheffield University lecturer friend, and when they delightedly applauded him, ‘Come and do it again!’ Before long Steven had been asked to join the staff in both Engineering and Management schools, industrial organisation work with which he continued until taking ‘early retirement’ at 72. In 1995 Beth Shalom, the National Holocaust Centre was opened in Laxton, Notts, and Steven, an excellent and experienced speaker, now has another busy new career despite being in his 90th year – sharing his Kindertransportee experiences there, in schools and as widely as possible. The award-winning Kindertransport documentary film, ‘Into the Arms of Strangers’ will be shown twice at QUAD as part of Derby’s annual Holocaust Memorial Day commemorations (details in 2016 Programme) with both showings followed by a live Q and A session with Steven. These events are free, but booking is strongly recommended (01332 290606). Don’t miss this!